Do you ever want to eat food that makes you feel like a kid? You know– chicken nuggets, string cheese, fruit by the foot, PB&J? I guess I’ve been struggling with the fact that I’m getting older and lately I’ve found myself clinging to things that make me feel young. 25 is a weird age. It’s a transition point– a time where you’re torn between being a responsible adult and acting like an adolescent. I’m not going to visit Chuck-E-Cheese or watch Nickelodeon anytime soon, but I can certainly eat like a child without too much judgement. Besides, I always think it’s pretty cool when restaurants serve things like “Adult Mac ‘n Cheese” or “Truffle Tater Tots.” Who doesn’t want to order that? The big problem with classic kid food is that it’s usually loaded with fat. So I thought to myself, what’s something that can cure my craving but won’t wreck my waistline? Soup! Tomato Soup with grilled cheese! Don’t worry, I’m not going to tell you to break out the Campbell’s and Kraft Singles. 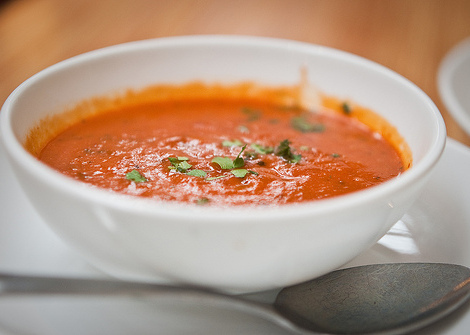 I incorporate roasted tomatoes, basil, thyme and a touch of cream (ok, half & half) in my soup. For the grilled cheese, I actually make a quesadilla. I use a low carb tortilla with sharp, lowfat cheddar chesse– I feel it’s less “doughy” than a grilled cheese with plain ‘ol white bread, and also a dip-friendly texture for soup. I would call this meal comfortably chic. It’s familiar and satisfying yet totally gourmet. Preheat the oven to 400 degrees. Toss together the tomatoes, 1/8 cup olive oil, salt, pepper. Spread the tomatoes in a layer on a baking sheet and roast for 35 minutes.In an stockpot over medium heat, saute the onions and garlic with 1 tablespoon of olive oil, the butter, and red pepper flakes for 10 minutes, until the onions soften. Add the canned tomatoes, basil, thyme, and chicken broth. Add the roasted tomatoes, including their liquid on the baking sheet. Bring to a boil and simmer uncovered for 35 minutes. If you like your soup a little less chunky, you should put about half of it in a food processor then add it back to the stockpot. Stir in half and half and simmer for 5 minutes. Taste for more salt & pepper and serve hot with quesadilla or regular grilled cheese!